The Lenten season, that is. A season of fasting and prayer. It is when we abstain from eating meat on a Friday. I was kind of lazy to cook some fish for my lunch. It kind of takes much of my time when I'm cooking so I chose to cook some fast meal instead. I'm sorry, I just remembered taking a photo of it when I was halfway through my food! It's just the basic Lucky Me! 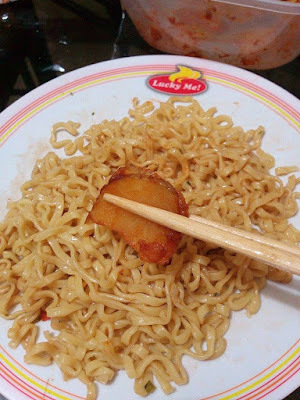 Pancit Canton that we buy on the grocery store but I paired it with this simple Potato Barbeque that is so easy to make which made my meal satisfying even when I'm fasting. Well, I only named it "Potato Barbeque" because of its flavor but I didn't actually cooked it in that method. Since I'm really lazy, I cooked them both at the same time. First I laid the thinly-sliced potatoes in a pan filled with water, seasoned it with some salt and a little pepper and waited for it to boil. 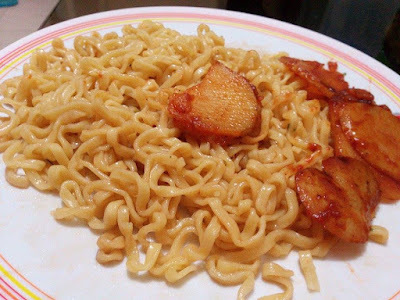 And then I mixed in there the pancit canton until it is cooked (about 3-4 minutes). I drained the water and put the potatoes on a plate laid with a paper towel to sip the remaining excess water. Just season the pancit canton with its own seasoning and set aside. Then I seasoned the potatoes with barbecue powder and that's it!